Balint Bajner scored his first goal for Notts County as the Magpies beat League One's bottom club Leyton Orient. The striker, on loan from Ipswich, played a one-two with Curtis Thompson, before firing past debutant Alex Cisak. Notts' travelling support was boosted by around 100 supporters from Hungary, who have been interested in the club since they signed Bajner in January. Mathieu Baudry and Shane Lowry went close for Orient, while Notts keeper Roy Carroll saved well from Dean Cox. The Magpies had the game's first chance but Garry Thompson fired wide when clean through, before Baudry had a backheel cleared off the line as Orient pressed. Bajner's first goal in English football put Notts ahead when he turned and shot past Cisak after linking up well with Thompson. Lowry was then involved in three good chances for the hosts as his free header clipped the top of the bar and his shot was cleared off the line by Mike Edwards, while he also set up Chris Dagnall who put his header wide. Orient substitute Cox went close after the break but saw his low shot saved by Carroll. Notts move up to 14th in League One with their first win in five matches and are now four points off the play-offs, while Orient remain bottom and six points adrift of safety. "It is not my intention to always find someone to blame. "It was a game where we conceded a couple of chances at the beginning of the game - one they missed and one they scored. "Those are the little things we didn't do right as the rest of the game we tried to attack and created many chance. Unfortunately the ball didn't go in. "I am the manager and the responsibility is mine." "I think it was fate with the big man scoring. He has all of his family and friends down here supporting him. "It's a fantastic night for the club, it's so better to be winning a game, I can't stand losing. "It has been difficult recently, so the response tonight was fantastic. I hope this is a platform to start building, I hope this is a pivotal night in our season." 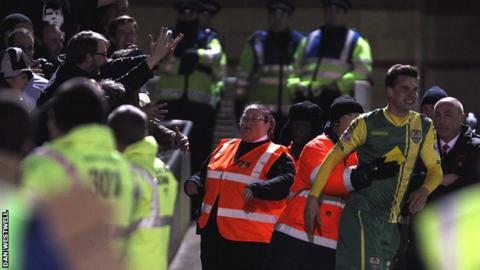 Match ends, Leyton Orient 0, Notts County 1. Second Half ends, Leyton Orient 0, Notts County 1. Attempt saved. Ryan Hedges (Leyton Orient) left footed shot from outside the box is saved in the centre of the goal. Kevin Lisbie (Leyton Orient) wins a free kick in the defensive half. Ryan Hedges (Leyton Orient) wins a free kick in the defensive half. Substitution, Leyton Orient. Ryan Hedges replaces David Mooney. Josh Wright (Leyton Orient) is shown the yellow card. William Hayhurst (Notts County) wins a free kick in the defensive half. Corner, Notts County. Conceded by David Mooney. Attempt saved. Dean Cox (Leyton Orient) right footed shot from outside the box is saved in the centre of the goal. Shaun Batt (Leyton Orient) wins a free kick on the left wing. Blair Adams (Notts County) wins a free kick on the right wing. Corner, Leyton Orient. Conceded by Michael Edwards. Attempt blocked. Kevin Lisbie (Leyton Orient) right footed shot from the right side of the box is blocked. Attempt saved. Kevin Lisbie (Leyton Orient) header from the centre of the box is saved in the centre of the goal. Substitution, Notts County. Kwame Thomas replaces Balint Bajner. Attempt missed. Dean Cox (Leyton Orient) right footed shot from the left side of the box is too high. Gary Jones (Notts County) wins a free kick in the defensive half. Attempt missed. David Mooney (Leyton Orient) right footed shot from outside the box misses to the right. Corner, Leyton Orient. Conceded by Hayden Mullins. Attempt blocked. Kevin Lisbie (Leyton Orient) header from the centre of the box is blocked. Substitution, Leyton Orient. Dean Cox replaces Bradley Pritchard. Substitution, Leyton Orient. Shaun Batt replaces Chris Dagnall. Attempt missed. Liam Noble (Notts County) right footed shot from outside the box is too high. Foul by Kevin Lisbie (Leyton Orient).